Edouard Pecourt in front of his record shop La Boîte à Disques in 1972. 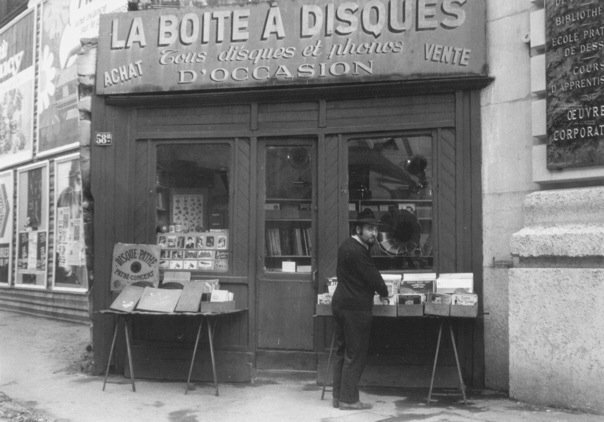 The UCSB Library has acquired the cylinder collection of Edouard Pecourt, a Parisian record dealer and collector who owned La Boîte à Disques at 58 bis Rue du Louvre in Paris from the early 1950s until moving to Portland, Oregon in 1986. Pecourt's extraordinary collection of over 3,000 cylinders, almost all French repertoire from the turn of the 20th century, includes hundreds of cylinders issued by Pathé including salon and concert (stentor) sizes, hundreds recorded by smaller companies such as Cylindres Dutreih, Société Francaise des Cylindres Artistiques, Phenix and other French companies, as well as hundreds of cylinders made by the French divisions of Edison and Columbia records. 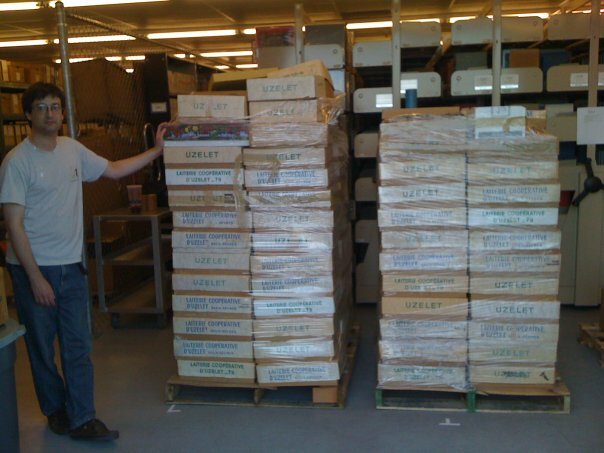 There are nearly 1,000 brown wax cylinders in the collection. Paris was one of the major centers of cylinder production and this collection dramatically broadens the scope of the UCSB collection to more fully reflect the international nature of the early phonograph industry. We are delighted that we will eventually be able to bring this significant collection of French recordings to a wider audience. Cylinders after arriving at the UCSB Library's warehouse. A full inventory and cataloging of the collection has commenced and cylinders will be added to the website as they are cataloged, at which point digitization of the collection will begin. Search for "Pecourt collection" to see what has been cataloged to date.